Welcome to our Institute laboratory in which you will engage in hands on projects exploring the science that underlies weather, climate and climate change in the context of key global environmental challenges. You will learn about the science of climate, how to deal with noisy imperfect data, how to write reports (you can satisfy your CI-M writing requirement through 12.307) whilst honing your ability to speak in public. Dig Deeper – review the previous three projects and dig deeper. We meet Tuesday and Thursday 2:30 pm – 4:30 pm, in Room 54-1623 of the Green Building. Contact Lodovica Illari or John Marshall for more information. For course announcements and forum see accompanying Stellar website. 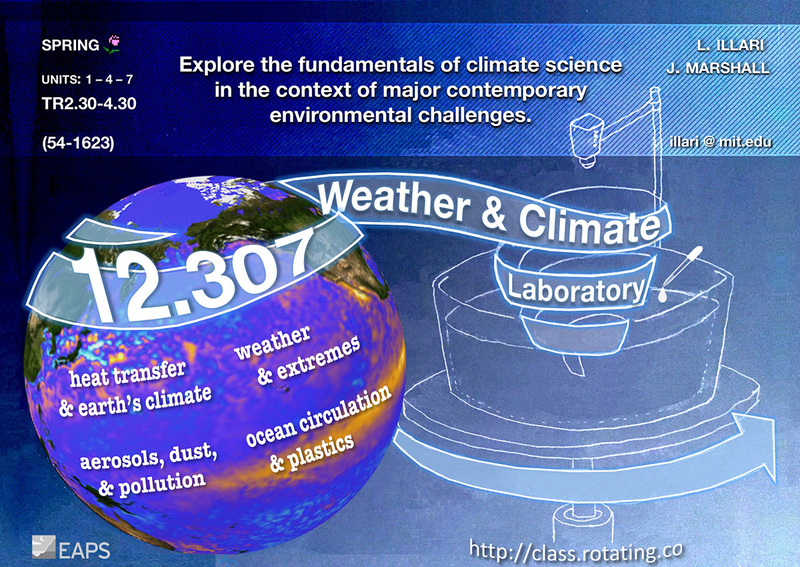 12.307 is an undergraduate Institute Laboratory Course intended to illustrate, by means of 'hands on' projects, the basic dynamical and physical principles that govern the general circulation of the atmosphere and ocean and the day to day sequence of weather events.